Finally, a Cliff Edwards CD from ASV! While Cliff recordings have appeared on numerous ASV compilations, ASV has finally released a full CD of Cliff's songs. 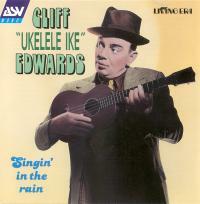 This is a great collection of Cliff Edwards songs from the early 1920s to early 1940s originally released on 78s. The sound quality of this CD is superb. If you are wanting an introduction to Cliff Edwards songs, buy this one first.